When I first started work on the Heartstone Collection, I wanted to create a story with layers of depth that any level of reader could walk away from wanting to discuss what they’d discovered about themselves. 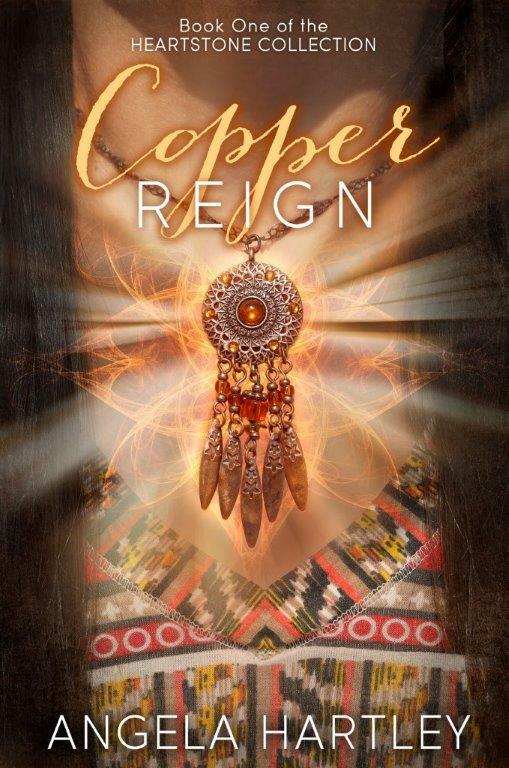 On the surface, the first book, Copper Reign is a love triangle, but if you delve deeper into the core this story is a battle of personal truth. Nina starts out as a weak teenage girl full of insecurity and doubt, and grows into a woman so strong and assured that even the devil himself can’t touch her. It is a right of passage that reflects pieces of many of our lives, and sparks the debate of create or fate. With all of this in mind, I hosted a dinner at my house with my first readers who just happened to be the neighborhood book club. I wanted to see what type of discussions sparked up from my manuscript, and see if I was on the right track. Unfortunately, little was said. They smiled sweetly, and said they loved my cute little story, and that was that. The real debate took place the next month when I wasn’t able to attend. I live in a very conservative community. Needless to say, there were strong feelings on both sides, but they were too polite to talk about their issues in front of me. I completely understood. I hadn’t explained that my father was Irish. There aren’t very many ways to offend me, but luckily rumors trickled back, and I couldn’t have been happier. I’d hit the sweet spot. Anything sparking that much emotion definitely had my readers thinking. That’s awesome! And what any writer, or book club hostess dares to hope for. I’ve put together a discussion guide and recipes to help your Copper Reign themed book club be a success, and although my appearance shut down the debate in my neighborhood, I’d still be happy to video chat into yours, or even stop by if you live with a reasonable distance! Find me on Facebook and we’ll talk. Amazon, iBooks, Kobo, and Barnes and Noble. Drink: Ocean Blues Punch (Sprite mixed with Blue Raspberry Kool-Aid). Dinner: Shrimp Scampi (saute’ 40 medium-sized shrimp in 1/2 cup of butter and 2 tablespoons of garlic salt, serve with 1 lb of linguine, 2 medium sized zucchini saute’d 1/4 cup of butter, white chardonnay, and garlic bread) serves 6. Dessert: Angel, and Devil’s Food Cake topped with appealing Strawberries on Cream (mix and bake cakes to boxed specifications, top both with strawberries and whipped cream). In Copper Reign, Nina and her mother face issues beyond our reality, but the way they cope with one another reflects countless parent/child relationships. For better or worse, why do parents feel the need to mold their children into something they’ve pictured? At the beginning of chapter two, Nina confides in Nate, and instead of judging her for being different he asks her out. How hard was it to take that leap of trust, and why did she hesitate to accept his offer? The best moment of Nina’s life is quickly snatched away and replaced with tragedy. It’s a common theme throughout the novel. How does Nina cope with adversity in the beginning of the story compared to the end? After her parents’ death, Nina honors her mother’s last wish, and uses the amulet to lock away her gift. She is held in a holding pattern until the amulet fails, at which time all of her emotion comes flooding back. What do the walls of protection represent, and who is Nina truly facing when her safety crumbles? Sinauf has discovered her name, and he’s coming for Nina. He’s the embodiment of everything she fears and desires. She’s drawn to him, even after she watches her best friend, Jenny kill herself under his power. This trope goes back to the beginning of women’s lit. Good girls can’t seem to resist the allure of reforming a bad boy. Why is that? And how do these types of relationships differ in actual life? Nate is everything a girl could want, handsome, attentive, and fun, yet Nina continues to fight loving him. What do you think were the reasons she avoided her feelings, and what methods do you consider Nate’s most effective in overcoming this obstacle? Sinauf (aka Sinclair Devereux) burns through Nina’s world like a wildfire, consuming her every thought. She’s tricked into betraying Nate, and turns him away. Why did she think this was the right course of action? Here’s a fate, or create moment to question. Would anything have changed if she’d chosen to stay? Nina’s in hell, quite literally. It’s been revealed that Sinauf and Sinclair are only a couple of a thousand personas the Archangel Lucifer has used throughout his time on Earth. She’s discovered his plan to destroy the world, and her role. Instead of allowing him to use her, Nina decides jump, and her sacrifice opens the Copper Way. Going forward, what will this mean for their world? Discuss the choices that drive the ending, epilogue, and what these decisions will mean for the books to come.